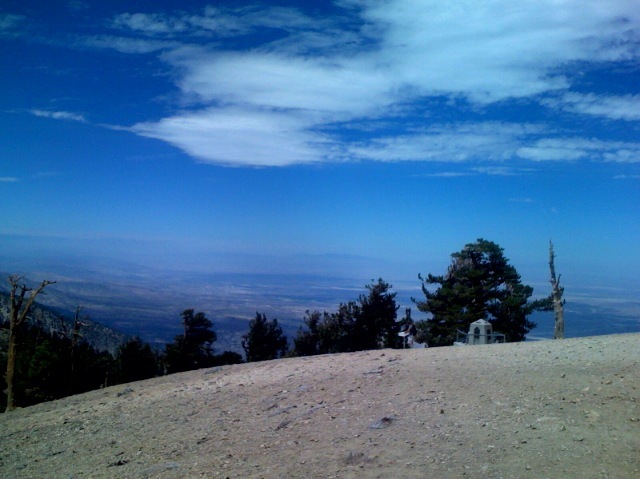 I just got back from a gruelling hike up Mount Baden-Powell in the Angeles mountains, the range that surrounds the north of Los Angeles. They’re a different beast than the Santa Monicas, higher, steeper and more rugged, pure heaven for someone who grew up in a place flatter than Kansas. In the winter, I often see snow on the peaks above me as I’m driving through a heat-wave in the Valley! Yesterday, me, Liz and a few friends from work did a 2,800′ climb over four miles, to get to the peak at 9,400′. That was a killer, especially with the elevation gain. We, of course, ran into the obligatory old bloke near the top, who had hiked twelve miles to get there from the other end, and was happy to tell us about all the 17,000′ one-day elevation gains he’d done. My excuse is that all some of these retired folks do is go tearing around the mountains all week. How am I meant to compete with that, sitting in front of a computer for ten hours most days? 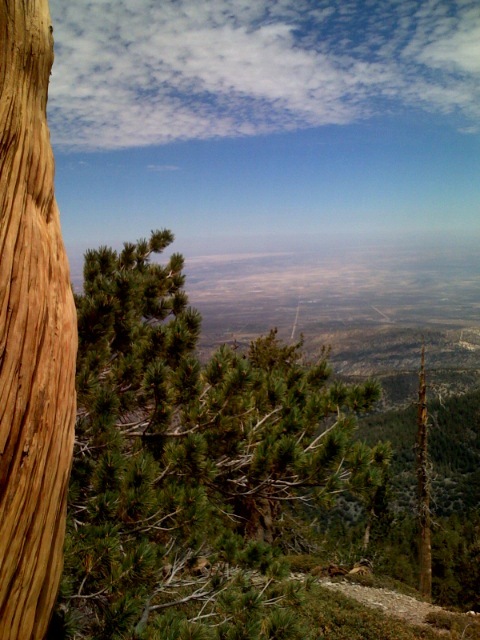 On a clear day, you can look down on the desert 8000 feet below to the north, and out to the Channel Islands in the Pacific to the north. The only down-side is that it’s so wind-swept and snow-covered in the winter, that only a few hardy plants survive at higher elevations, mostly gnarled pines and a few tough shrubs. The Santa Monicas are still my favorite haunt, with all their wild-flowers and waterfalls, but I love having such a spectacular range on my doorstep.